It has been an awesome weekend in venice. Had some decent weather and the yf finally showed up in close. 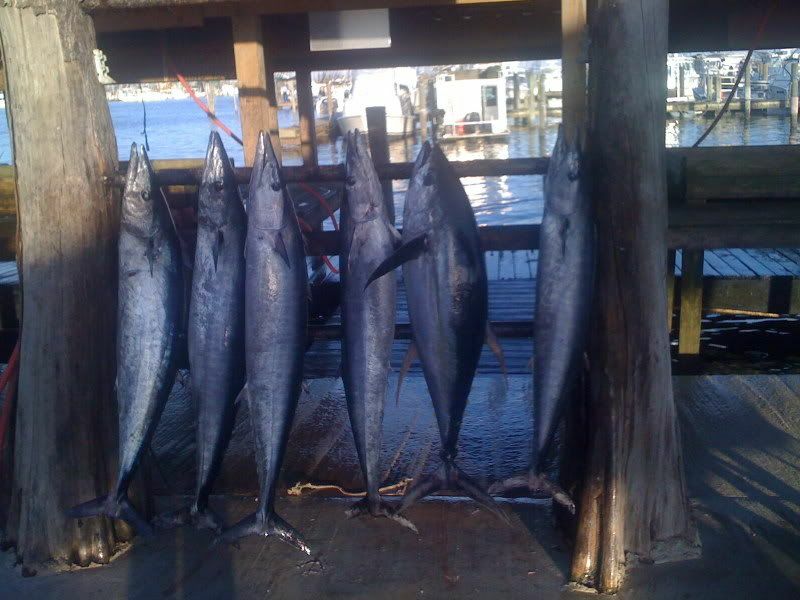 I fished thursday with JW and friends and we went looking for wahoo and wahoo we found. The first couple of rigs were dry runs and then they turned on hard. Using pink stretch 30s and cotton candy bombers we were doubling up on hooters left and right. We were fishing mostly shallow rigs in around 250 feet of water. 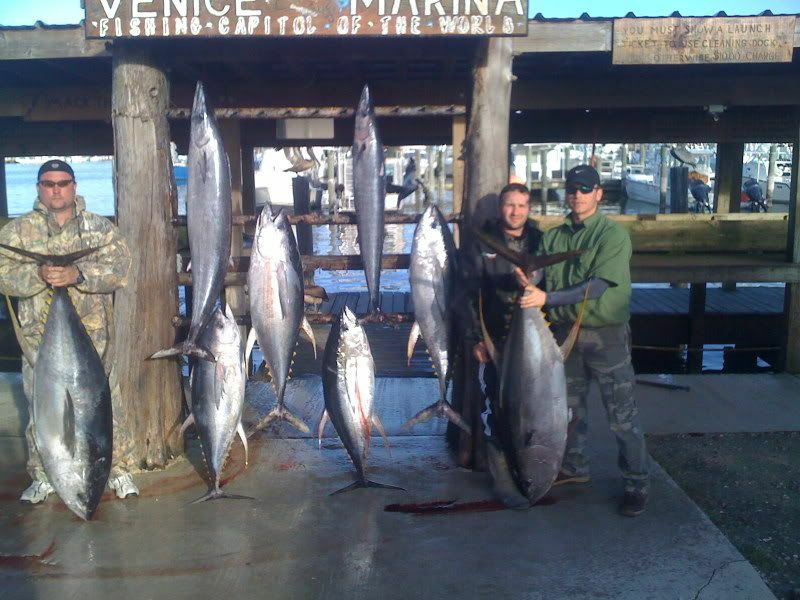 We ended up with 12 wahoo on the board at the dock with the biggest at 70 pounds. I had JW again for day two and we were supposed to go long looking for tuna. I headed out to the floaters and about halfway out decided it was too rough. That wasnt good because I had put myself way out of position to make it back to where I have been fishing. I tried some new spots and found out why I hadnt been fishing there. There were NO FISH Around. We went 0-2 on hooters and that was it. The water was pretty all around just no fish or bait. Lee ran an overnighter on thursday night on his glacier bay though and absolutely hammered the yf. 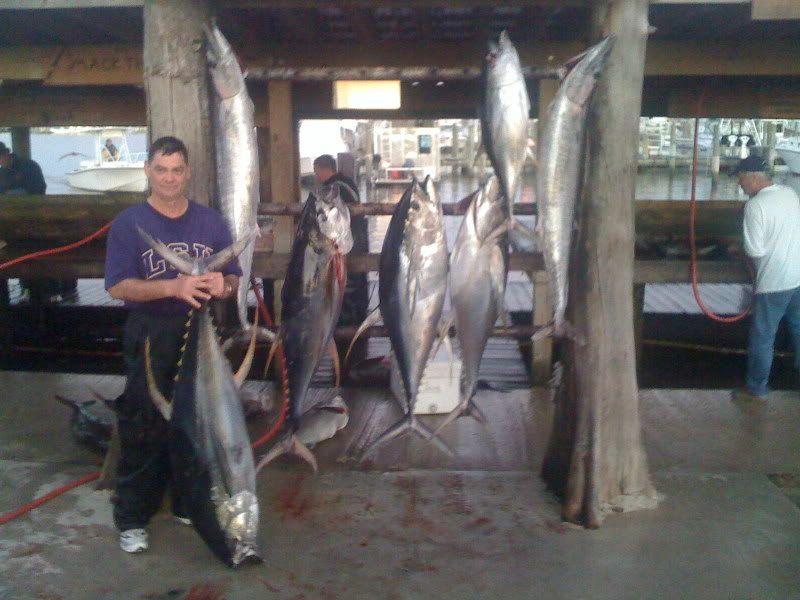 I dont have any pics of it but they came in with 12 yellowfin from 30-50 pounds and about 20 blackfin. Me and Lee both had day trips on saturday and we headed back out to where I have been hammering the wahoo. After some difficulties with fish not biting we ended up in the right spot at the same time and started picking away at wahoo and nice yf on the troll. I caught an 80 pound yf on a bomber and Lee had a nice one on a mirrorlure. I called it quits early with five wahoo and the yf because I had a deathly seasick dude. Lee waited them out and started chunking and quickly put 4 more yf in the box to 120 pounds and ended up his day with five yf and 2 wahoo. After I saw that back at the dock it had my fire burning to go put a whipping on the yfs the next day. Small craft advisory be dammed. We left out not knowing what kind of seas we would find and low and behold it was the best day of the week. I never saw a whitecap all day on sunday. The forecast seas were 4-6 footers and all we had was a light swell. 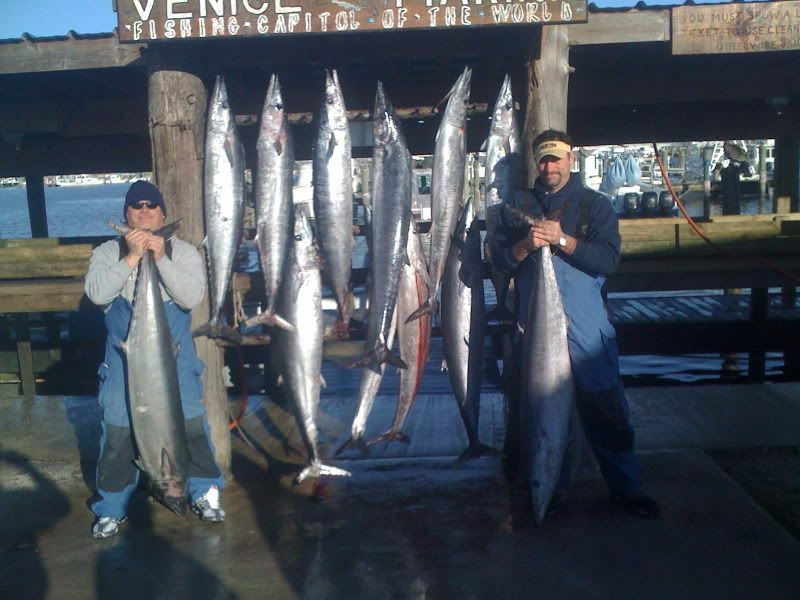 I started trolling around and picked up a couple of wahoo to 75 pounds before Peace told me he was hooked up to a tuna. I started drifting and chunking and immediately almost got dumped on a 50 before it broke off. I kept waiting for the fish to stop or turn and it didnt and before I could chase it the leader popped. I was ready for the next one though andwe chased it around and put a 140 in the box in about 15 minutes. After that it was a steady day as we put 5 more yf in the box between 80-140 pounds. The grande finale had us double up on a 139 and a 100 pound fish while we had more fish just rolling through the slick. We had to call it a day cause I couldnt put any more fish in the box. The two biggest ended up being 140 and 139 with all the other fish being in the 80-100 pound class.